(Colorado Springs, Colo.) – Two first-time Division I National Champions were crowned on Sunday as Isis Washington (Parsippany, N.J.) and Adam Mathieu (Brooklyn, N.Y.) each won gold in Salt Lake City at the Division I/Wheelchair National Championships. The title marks the second straight gold for Washington on the NAC circuit and her third podium finish this season after taking bronze in October and gold in January while Mathieu claimed his second straight NAC medal following his bronze medal win in January. Undefeated on the day, Washington went 6-0 in pools before besting both Alexis Hedvat (New York City, N.Y.) and Sara Proctor (Boulder, Colo.) by 15-6 scores. In the semifinals, Washington used five straight single lights to overcome 2018 Senior World Team Champion and Notre Dame senior Amanda Sirico (Bowie, Md. ), 15-9. Washington would fence 15 year old Michaela Joyce (Sterling, Va.), a 2019 Junior Olympic silver medalist, in the gold medal finals. After the first break, Washington held an 11-8 lead. Joyce scored the first point of the second, but Washington went on a 3-0 run to go up 14-9 and doubled out at 15-10 to earn the National Championshp title. Rio Olympian and 2018 Senior World Team Champion Kat Holmes (Washington, D.C.) medically withdrew after the quarter-finals and ended the day with a bronze. The 2019 Senior World Championship Women’s Epee Team is now set as Holmes will compete at her sixth Senior Worlds alongside her Olympic teammates, Courtney Hurley (San Antonio, Texas), Kelley Hurley (San Antonio, Texas). Kasia Nixon (Los Angeles, Calif.), a 2017 Junior World silver medalist and junior at Princeton, qualified for her first Senior World Team after her fifth-place finish on Sunday. In the men’s foil competition, Mathieu took gold with 2018 Cadet World Champion Kenji Bravo (San Francisco, Calif.) earning silver. Two-time Junior World team medalist Brian Kaneshige (Hoboken, N.J.) and Stanford sophomore Lucas Orts (Burlingame, Calif.) claiming bronze. Following a 15-6 victory over Bin Huang (Concord, Mass. ), 15-6, and a 15-13 win against Philip Shin (New York, N.Y.), Mathieu defeated 2019 Cadet World Team member James Chen (New York City, N.Y.), 15-10, to advance to the quarter-finals, where he cruised past Gregory Mitberg (Beaverton, Ore.), 15-4. Down by one to Orts, Mathieu scored the final two points of the period to go up, 10-9. Orts tied the score at 13, but Mathieu finished the bout with two points for the 15-13 victory. Against Bravo with a title on the line, Mathieu took the final three points of the first period and the first three points of the second to take a 9-3 lead. He went on to win the bout, 15-8. On the final day of the Wheelchair National Championships, Shelby Jensen (Salt Lake City, Utah) clinched the gold in women’s saber, sweeping all three women’s titles in Salt Lake City. Jensen had momentum from the start, going 10-0 in pools to giving up no more than five points in her DEs. She controlled her semifinal against 2017 Wheelchair World Team member Patricia Dykes (Gulf Breeze, Fla.), 15-5, and although Hailey Bauer (Denver, Colo.) scored the first point of the final, Jensen went for eight straight on her way to a 15-3 victory. On the men’s side, Rick Swauger (Logan, Ohio) earned his first win on the NAC circuit. Noah Hanssen (Ellicott City, Md.) took silver while DeJuan Surrell (Jackson, Miss.) and Tim Kortenkamp (East Palo Alto, Calif.) stood on the podium with bronze. Swauger went 5-1 in pools and reached the gold medal final with a 15-7 victory over Surrrell. Down 12-9 to Hanssen, Swauger scored four straight to take a one-point lead. Hanssen responded to even the score at 13, but Swauger took the final two points for his first national championship. Division I Team National Championships also were awarded in men’s saber and men’s épée. Team Peter Westbrook won the men’s saber championship with Josef Cohen (Barrington, R.I.), Noah Te Velde (Leverett, Mass. ), Khalil Thompson (Teaneck, N.J.) and Nolan Williams (Watchung, N.J.) taking the top step of the podium. Larry Cai (Marietta, Ga.), Jesse Liu (Marietta, Ga.) and Qilin Tong (Marrieta, Ga.) of Nellya built a 20-17 lead over PWF after four rounds, but PWF won the final five bouts, including an 8-1 win in the fifth by Thompson, to advance to the final, 45-34. There, Peter Westbrook faced Durkan Fencing Academy – made up of Maciej Biernacki (Middle Village, N.Y.), Quin Burgunder (New York, N.Y.) and Grant Williams (Atlanta, Ga.) – and won the first eight bouts to win, 45-29. Boston Fencing Club, made up of Hyunseok Choi (Watertown, Mass. ), Spencer Kuldell (Newton Center, Mass.) and Peter Souders (Silver Spring, Md. ), claimed bronze with a 45-42 win over Nellya in the bronze medal match. NYAC Red won the Division I Team men’s Epee National Championship with a lineup that included Olympians and World Team members. 2018 World Team member Jake Hoyle (New York, N.Y.), 2016 Olympian Jason Pryor (Brooklyn, N.Y.), two-time Olympian Soren Thompson (New York, N.Y.) and 2013 Senior World Championship Team member Alex Tsinis (Little Neck, N.Y.) only dropped one bout in the quarter-finals, winning 45-29. In the semifinals, NYAC Red faced Corwin Duncan (College Park, Md. ), Tristan Szapary (Wynnewood, Pa.) and Daniel Gaidar (Staten Island, N.Y.) of Fencers Club. NYAC Red won six of the first seven bouts to take a commanding 35-16 lead. Fencers Club won the final two, but the lead would be too big as NYAC reached the final, 45-33. The gold medal match pitted NYAC Red against a Peter Westbrook Foundation Team that included two-time Senior World Championship team medalist Ben Bratton (New York, N.Y.), 2017 Senior World Team member Adam Rodney (New York, N.Y.), Shomari Moore (Moorestown, N.J.), and Dwight Smith (Elmont, N.Y.) NYAC Red won six of the nine bouts for gold, 45-31. Gold medals were also on the line as part of the April NAC. In the veteran 60-69 women’s saber competition, four Veteran World Championship Team members stood on the podium with 11-time Vet World medalist Jane Eyre (Woolwich Twp, N.J.) taking the top step. Seven-time vet World team member Heidi Runyan (San Diego, Calif.) won silver and two-time Vet World medalist Linda Dunn (Greenfield, Ind.) and four-time individual Vet World medalist Lydia Fabry (Simi Valley, Calif.) earned bronze. Eyre blazed past her first two opponents, besting Esperanza Alzona (Frederick, Md.) and seven-time individual Vet World medalist Jennette Starks-Faulkner (Middletown, Conn.) by 10-3 scores. After defeating Fabry, 10-7, Eyre gave up just one point to Runyan, 10-1, to return to the top step of the podium. In the veteran 70+ women’s saber event, two-time individual Vet World medalist Susan Hurst (San Diego, Calif.) took the gold with a 10-8 victory over 10-time Vet World medalist Ellen O’Leary (Seattle, Wash.) in the final. Annie Mannino (Oceanside, Calif.), a 2018 Vet World bronze medalist, and Claire Hanamoto (Sacramento, Calif.) won bronze. Hurst’s second straight podium finish and first gold since 2016, she overcame 2017 Vet World Team member Marsha Reichman (Bethesda Md. ), 10-6, and Hanamoto, 10-7 to reach the final. The veteran 50-59 women’s saber competition saw three-time Vet World team medalilst Robin Pernice (Carlisle, Mass.) earn gold, marking her second win at her last three national events. Barbara Shinn-Cunningham (Pittsburgh, Pa.) also claimed bronze. Emily Grajales (Apopka, Fla.) won her first North American Cup title with gold in veteran 40-49 women’s saber. Laura Johnson (Silver Spring, Md.) earned silver while Kelly Dewsnup (Tigard, Ore.) and Lynn Zhang (Portland, Ore.) secured bronze. Grajales reached the final with 10-5 wins over Yik Chun Wu (Alpharetta, Ga.) and Zhang. In a close match-up, Grajales edged out Johnson, 10-8. The veteran men’s age group saber events also took place on Sunday. In the 40-49 competition, Stan Prilutsky (Dublin, Ohio), Joshua Bush (Greenwood, Neb. ), Gherardo Mauri (Enfield, Conn.) and Stephen Pashby (Durham, N.C.) stood on the podium. Prilutsky, who earned his second straight podium finish and first ever NAC gold, fenced his toughest DE bout at the start, outtouching David Tsung (San Mateo, Calif.), 10-9. In the medal rounds, Prilutsky bested Pashby, 10-5, and Bush, 10-4. Like Prilutsky, three-time Vet World Team member Chris Matt (Fairfax Station, Va.) won his first NAC gold medal in the 50-59 cateagory. Next to him on the podium were Vitali Nazlymov (Bethesda, Md.) with silver and 2017 Vet World Team member Tamas Vidovszky (Folsom, Calif.) and Mark Lundborg (Issaquah, Wash.) with bronze. After edging out 2012 Vet World Champion Will Milne (Redwood City, Calif.), 10-8, Matt secured a berth in the gold medal final by outtouching Lundborg, 10-9. In the final, Matt found some breathing room, overcoming Nazlymov, 10-5. 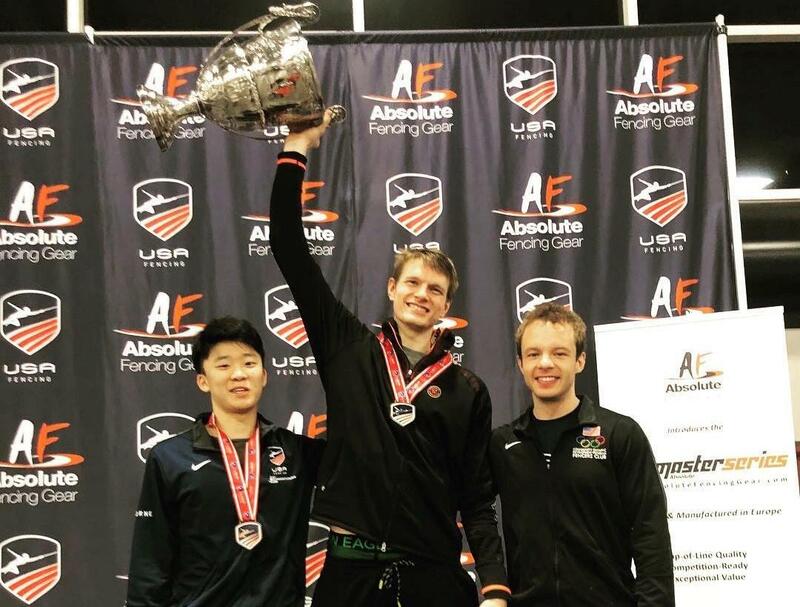 Josh Runyan (San Diego, Calif.) is no stranger to the top step of the podium at national events as he won his second straight gold and has now finished on the podium at five of his last six NACs in the veteran 60-69 men’s saber event. He was unstoppable on Sunday, going 5-0 in pools and giving up four or fewer points in three of his four direct elimination bouts. Seven-time individual Senior World medalist David Seuss (Charlestown, Mass.) claimed bronze, losing to Kastor, 10-7, in the semis. To win gold, Brown would have to go through two Vet World Team members. With a 10-6 win over four-time Vet World team medalist Vic Bianchini (San Diego, Calif.), Brown advanced to the final, where he defeated two-time Vet world team medalist Phil Sbarbaro (Vienna, Va.), 10-7. John Digennaro (New York, N.Y.) earned the second bronze. Bianchini returned to compete in the Veteran +80 men’s saber competition later in the day, winning gold. Four-time Vet World medalist Jim Adams (Rockville, Md.) earned silver while Fritz Chang (Lexington, Mass.) and Bob Baldwin (Palatine, Ill.) took bronze. Bianchini overcame Chang in the semifinals, 10-7, before cruising past Adams, 10-4. In the veteran open women’s foil competition, 2016 Vet World bronze medalist Lynn Botelho (Indiana, Pa.) won her second gold medal in two days after earning the Veteran 50-59 gold on Saturday. The semifinals saw a re-match of Saturday’s semifinal between Botelho and Ann Totemeier (Boulder, Colo.) with Botelho once again coming out on top, 10-9. In the final, Botelho faced the newly crowned 40-49 gold medalist, Julie Seal (Eagle Mountain, Utah). The bout went down to the final touch with Botelho victorious, 10-9. Suparna Vashisht (Monte Sereno, Calif.) also stood on the podium with bronze. Keith Lichten (Oakland, Calif.) took the top step of the podium in the veteran open men’s epee event. Following a 10-4 victory over Jeffrey Kuhn (Minneapolis, Minn.), a 10-3 win against Dave Swanson (Schaumburg, Ill.) and a 10-7 victory against David Hitchcock (Purcellville, Va.), Lichten reached the quarter-finals, where his opponent would be 2016 Vet World bronze medalist Daryl Taylor (Los Angeles, Calif.), the veteran 60-69 winner. Lichten, a silver medalist in Vet 40 at the December NAC, overcame Taylor, 10-7, in the quarter-finals to secure a medal and reached the final with a 10-6 victory over Carl Loeffler (Santa Monica, Calif.)His route to gold would go through 1992 Olympian Chris O’Loughlin (Jersey City, N.J.), but Lichten continued to roll, defeating O’Loughlin, 10-5. Jeff Hudson (Glendale, Ohio) claimed the second bronze. Two Division III events also took place on Sunday with Erika Castaneda (Clyde Hill, Wash.) winning in women’s epee and Jorge Rojas (PUR) taking gold in men’s foil. Fourteen-year-old Castaneda overcame Patricia Wilkens (Hilton Head Island, S.C.), 15-12, in the table of 64 before cruising past Devon Belsley (Chicago, Ill.), 15-5. Following a 15-7 victory over Nora Weber (Denver, Colo.) in the 16, Castaneda edged out Lulu McCutchen (San Antonio, Texas), 15-13, to reach the semifinals. With a medal guaranteed, Castaneda won two more close bouts, outtouching Renata Russell (Boise, Idaho) and Sobia Reid (Watchung, N.J.), 15-13, for her first NAC gold medal. Sophia Rose Glassner (Mendham, N.J.) took the fourth spot on the podium with bronze. Like Castaneda, the gold was the first of Rojas’ career. Standing next to Rojas on the podium was Kian Dierks (San Francisco, Calif.) with silver and Aaron Kim (Fullerton, Calif.) and Karthik Shaji (Redmond, Wash.), who each took bronze. Rojas gave up a combined eight points in the first four rounds with 15-1, 15-2, 15-4 and 15-1 victories en route to the final, where he clinched gold with a 15-6 win over Dierks.